An IHRT blast from the past. Still all true as the day it was written...now with pictures of babies to lure in the desparate, vulnerable sufferers of Adhesion Related Disorder. The "why's of everything" that occurs surrounding "Endogyn" reveled, and in absolute truth! Daniel Kruschinski finally gives up the answers and in his own words! Today, stands out as the most sad and heart retching day we have had here in IHRT! Realization hit Dawn and Beverly right between the eyes after we saw information located in the Endogyn web site that was brought to our attention yesterday! When we scrolled down to the area of concern in the "Endogyn" web site, we were shocked, absolutely horrified at what we encountered there, and nothing really prepared us for it, yet, when we saw and read Daniels own words, we realized that we had our answer to the many things that seem to surround this surgeon when it comes to his interactions with persons afflicted with ARD! We also realized that of ALL the surgeons throughout the world, that we are aware of, who present via a website to advertise themselves in the world of ARD, this website presentation is the worse thing we have ever encountered! We also find another VERY disheartening scheme that Daniel uses on his website that "absolutely 100%" NO other surgeon in this world would ever even consider doing when addressing the agony of ARD symptoms shared by those afflicted with it! Daniel uses pictures of food, and lots of it, to lure some of the most desperate and suffering patients into his operating room! Though we could go on and on presenting bogus material off of Endogyn’s web site, we will finish today’s message with this message as it is most imperative that we expose the truth of this matter verses what is presented in Daniels web site, which is an "embellishment" of the facts, as ussual! ANY and ALL claims of clinical studies, experimental procedures or research studies that Daniel claims to have done or be involved in right now, ARE NOT governed by anyone but himself.. In fact, Daniel answers to no one but himself, and it is in this truth as shared to the world by HIM on HIS web site, that we now understand what can only be called "unscrupulous behaviors" exhibited by him to persons afflicted with ARD! We are certain this same behavior is exhibited in his behaviors over all as when it is a part of you, you do not change whether your in an operating room with a scaple in your hand, or drinking in a bed with someone other then your wife!! Remember people, you can hide yourself for a while, but NOT forever! Your the same person no matter where you are and eventually, the REAL you will emerge! All these "claims" being amde in Endogyn’s wed site are unsubstantiated, not credible, offer no validations, no credentials, material with false claims, pictures of foods are used to torment the hunger of those who cannot eat, traps are set that play on the symptoms of very ill, desperate people, and all meant to lure potential patients to an unproven surgery, to this man, and for these reasons only, "self gain and greed!" We know this today because Daniel told us, this is because of any surgeon we have ever known in the world of ARD, Daniel HAS no scruples!" All other surgeon we know of have "scruples!" Even if they cannot offer a high quality adhesiolysis, and even if they do make the attempts at it and fail, one thing they do posses that Daniel doesn’t, is the professionalism to keep their religious beliefs, or lack of them private! At least, if these surgeons do not allow Jesus into their operating rooms to guide their hands and give strength and healing to their patients, at least they keep it to themselves! The answer to everything at Endogyn is in this link! "We can’t rely on him… LOL"
Though Daniel makes light of our "Lord, Jesus Christ" being present at a surgery with him, for those of us who are Christian and hold in our hearts all the offers of prayers being said for us, and wishes of "God Speed" as we face yet another surgery, it IS a meaningful issue! Our Lord, Jesus, being with us during a surgery IS one of the most important things we have to hold onto when in a surgery, and though we turn to our Lord Jesus in all things, it is in this surgery where we are the most needy of his presence in our lives, as do our loved ones, so far away. Daniel might find this a joke, and he express’s that he does not have Jesus in his life, which is his prerogative, but to make fun of this and to draw a parrel that Jesus is NOT part of his surgical team because HE doesn’t have Jesus in HIS life, well, this is the ultimate act of egotism and greed we have ever found within the medical community world wide! We ask you to take a minute when you visit this page in Endogyn, and ask yourself just what IS Daniel saying here? Is he claiming that he alone will make the difference in the outcome of your surgery, and if so, that too okay, however, is he boosting that he is not Christian, is he belittling those of us who are Christian orientated, is a non-Christian less of a human being then HE is as a member of his Jewish faith, and does HE treat a non-Christian patient differently then he treats a Christian patient? And, yes, he would know who was who, as Christians talk freely of their Lord Jesus when facing a surgery! It is one thing to not be a Christian, which is really neither here or there, unless you MAKE it an issue as Daniel has, however, to discredit our Lord Jesus as being an integral part of a Christians surgery, is just plan wrong, and to do it in such a public and frivolous way it is scary!! Any surgeon who can post such a thing on his own public web site advertising HIS surgery and at the same time ridicule the Christian faith, lacks true compassion, respect, and professionalism, let alone the decision making qualities necessary when dealing with a human life under anesthetic and his scalpel! I also want to point out that the "groupies" who lend themselves to Daniels web site not only condone this behavior publicly, as well as compromised themselves as being recognized as reaching out to others with a Christian heart! It cannot be two ways, either you agree with Daniels bashing of Jesus, or you walk! We will know! Most important, YOU already know!
" No matter where you go, or what you do in your life, as long as YOU have Jesus with you, he IS with you and no one can come between that. Daniel might be able to keep our Lord Jesus out of his heart and surgeries, but he does not posses the power to keep him out of that operating room and surrounding YOU with his love and the prayers of all who are praying for you!" Jesus bashing is simply intolerable, and needs to be taken into consideration when you think about a surgery at Endogyn! Remember this, any understanding of Jesus Christ being an integral part of your life goes out the window the first time you encounter Daniel Krusinski! Is THIS the surgeon you want operating on you? God does not put people on paths, people are given a free will, they make choices, some good, some not so good, but choices, unhindered by even our Lord, but OUR choices just the same! It is sad to read stuff like the this post in Endogyn, where people who believe in Jesus simply put it ALL in his hands thus freeing themselves of all responsibility of what happens to them! In this case, this lady is well on her way to a terrible future, after being lured by false material and claims, she has fallen victim to Daniel and his "groupies!" What she will have in her favor, and need, is her Lord, that is if she doesn’t place the blame on him instead of her surgeon, where it belongs, however, she did not do her homework effectively prior to going to Endogyn, thus she too is responsible for what is to come! Karen is a tough "spider" to avoid, so "Heart" had a formidable foe on the attack and cannot be blamed for wanting what was offered! I hope this is my aswer, Germany that is, at least he cares and that is so much more than most doctors that I have gone to. I am excited and hope to finalize my trip this week, if money comes in. My son came home from college today and all I could say is I hurt. He said," Wow, mom, can you believe your still in pain?" Everyday I think wow, what happened to me; wish I would have never had a hysterectomy. But I believe GOD has put me on this path, and I believe that I wil find a cure. Thanks for caring. if we take US$ or travellers cheques, we go to the Internet, take the exchange rate and thats it. Regarding all the payment, I even dont charge what the bank is charging me for money wire from US to Germany. What is the exact question here ? I dont see the question ? the following information located in the Endogyn web site was brought to our attention yesterday! You mentally deranged women are going to give people a lesson on Jesus??!!!?? PLUEEEZZZEEE!!! The real Karen Stewadr lies in the archives of the International Adhesion Society. At the time it was all we had and it was a wonderful place of support, caring and kindness for those afflicted by adhesion related disorder. Karen left the IAS permanatly scarred and it was never the same after she started her "riegn of terror" in her blind devotion to Dr. Kruschinski. Do your homework and see who you are really dealing with by searching the archives of the IAS message board. You Know what Karen has said...but what really happened? 2. Even if you think you can make such accusations, this is not the place to do it. If you have a gripe against someone - approach them respectfully and directly. Do not use this board as a battle ground. If you think you have a valid criticism about anyone, document it carefully. Summarise the points you want to make (in one or two short sentences) and then back it up with complete documentation. Do not use inuendo. It does not stand up in a court of law. It will not stand up here. Review your case and ask yourself if you are really being to harsh on the person. Do you really have evidence to support your point? Give them the benefit of the doubt. 3. DO NOT escalate tensions by responding on this message baord. Contrary to popular beleif - I do not spend 24 hours a day checking my email and message board postings. If you see something that looks odd - please tell either myself or Tracy Joslin (tracy.joslin@adhesions.org) by email and phone. I cannot guarnatee to remove posts immediately, but we will try. 4. Avoid the temptation to conduct your war even in email. What you say will end up on a message baord somewhere, no doubt out of context. 5. We ARE NOT AGAINST DR. Kruschinski. Please stop all allegations to the contrary. My post of a few weeks ago was fully endorsed by him. He has told me that some people misinterpreted that post. Again - HE FULLY ENDORSED THAT POST. We totally resent any accusation that the IAS has been behind any some smear camapaign. It is not true. 6. We encourage Dr. K (and any other doctor doing this kind of work) to collect his data and to present them to the medical community. Both Dr. K and I fully expect that given the severity of the ARD disease, there will be patients in whom pain or other symptoms will recur after his, or anyone else's surgery. 7. A message board is not the place to conduct serious medical research. A patient's perception about their problems is easily influenced by their expectations and their impressions. By continuing to post glowing reviews about Dr. K, or anyone use YOU ARE HARMING HIS CREDIBILITY. Let me spell this out. By inflating someone's expectations about their surgery with any doctor, you are going to make them more dissapointed if even the slightest thing goes wrong. Similarly, any posting of a problem may prompt a patient to believe that their minor problem may be similar. Consequently talk of "complications" can be blown out of proportion. Nonetheless - he has a section in his message board where he invites people to discuss their problems after surgery. The section is called: "Continuing pain after surgery Here you are welcome to discuss your problems after having surgery ... "
I do not think this is a terribly good idea to have such a section, but if you are compelled to discuss problems that is the place to do it. I have discussed this frequently with Dr. K and have stressed that we want him to collect sound and credible data. Please help him to do this by respecting the rules of this board. 8. Dr. K has shared with us (as well as posted on his own board)some preliminary results of his data. I STRESS preliminary becuase they are legitimately open to some interpretation IN EITHER DIRECTION. It seems that there have been some 33 US patients that have seen Dr. K in the last 11 months or so. Some of them must be excluded from the analysis for good reasons (eg patients have gallbladder or appendix operations etc) , leaving 27 patients for analysis. Of these 6 of them have reported some recurrence of pain or adhesions, which is 21%. THIS IS A VERY GOOD RESULT, but nonetheless a preliminary one. We will be happy to revise this estimate when there is full documentation from Dr. K. This compares very well with another study (that we will report to you shortly) in which a US doctor performed similar procedures (using Seprafilm and conventional laparoscopy) in 19 apparently similar patients with a 24% rate of return of symptoms.The follow up there was 1-32 months. The jury is not yet in however becuase we need to see longer follow up for both studies, as well as data from Dr. K's European patients. We encourage him to collect these data. Please help him maintain its credibility by refraining from comment in either direction. 9. Please note that both Beverly Doucette and Dawn Rose have resigned from the IAS, at their request. As soon as we are we will remove their names from the list of support contacts. Please let's return to the business of supporting patients in need of support. I believe you are misinformed as there is no effective adhesion barrier in the whole wide world. I actually feel bad for Covidian as they got left holding the bag by Confluent then Tyco. I feel perhaps your daughter was indeed fortunate not to have a barrier applied in the surgery you speak of. "Outcomes were assessed in 4 patients with second-look laparoscopy.6"
Have you ever considered this scenario? A company in the US starts with oh, lets use a Kruschinski word, an excursion and things are not working out as planned. It is easy to get a CE mark overseas. Would you consider it possible that adhesion barriers are available overseas in an attempt for big Pharma to save significant amounts of money by seeing "what happens" over there before they invest in a full US clinical trial seeking FDA approval? That is what I believe. Since we probably have everyones attention here, Why do you think it is OK for adhesion patients to have a major abdominal surgery in a cosmetic surgery day clinic? No ICU, no nothing...there is pathogen harboring carpeting throughout the clinic and in patient rooms for goodness sake. It is not by any means a safe place to have this type of surgery unless you can explain to me otherwise. I would also wish you could elaborate in public why you feel an AWL is better than a pnumoperitoneum? Are you aware that Dr. Kruschinski relies on a low level pnumoperitonium to insert his hook? So you get that evil CO2 anyhow and after you go all the way to Germany to avoid CO2???? 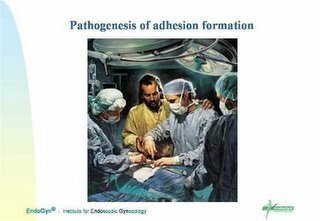 AWL in an adhesiolysis seem like a waste of time as there you are in surgery and the surgeon cannot visualized all areas where adhesions may be cut, so how many times must a person go? As many times as the unfortunate gentleman AZ was before he took his own life? Come now Karen, you must have spoken to him several times...How many times did Az have surgery at Endogyn? I count 7 but I could be wrong. I bet you know. Are you willing to share that information with us? In your article you avoid declarative statements and say words like "they may" do this or that. Kruschinski uses this tactic as well as I have observed it over the years. If he is all you say he is then why is he not grabbing headlines in all the medical journals? Does he recieve any money from Covidian? Do you even know? If I ran Covidien I would pay him to keep quiet as perhaps he has used spaygel and sprayshield more than anyone. Could you please elaborate on this statement, "While those who fight for the throat of their competitors by on line attacks"
Can you tell us who you believe is competing? Can you tell us who you feel is greedy? I agree with your statement about "attack, attack, attack" as I have sat here patiently and watched you do it to very fragile sick, suffering people...I see you publicly berate them and harass anyone who does not agree with you and why should anyone agree with you when what you espouse over and over again has no scientific basis? I actually believe you may not have the capacity to understand what you espouse in a scientific manner. Ok that is all the bad part and I only want to spread hope and education to all who suffer from ARD. I just read some very promising news about interfering with the process of fibrinolysis controlled genetically..looking to stop the scourge of adhesion related disorder by gene manipulation..now that sound promising for the time being and there are fantastic surgeons world wide that can perform a succesful adhesiolysis and I was fortunate enought to find some after I learned my hard, expensive and painful lesson at Endogyn. I apologise to all adhesion sufferers who had to witness this and I pray you have not been upset and if you are I am so sorry but I feel that this so self proclaimed adhesion activist and self published author has an agenda other than the end of suffering of adhesion patients. I was declared severly handicapped by adhesions in 2003 and last fall was reviewed and still considered hanicapped by adhesions. I have a yound child...school aged ( not and adult constantly refered to as a child) and I would do anything to spare my child this...yours too and that is why I take this stand against someone who is hopefully nothing more than very uninformed. Karen wrote: "To XXXXX: there is a cure for many people. (there is no cure and no effective adhesion barrier and the abdolift CAUSES adhesions) My daughter has been totally and completely well 8 years now. (what about subesequent bowel obstrtuction you say in your book, what of melissa claiming to still have PCOS and a c-section and our question is, did she present to Kruschinski with a j pouch?) Prior to our trip to Germany, she suffered-horribly, I might add-14 years. David Wiseman, of the IAS (adhesions.org) phoned me in 2003 and told me to STOP sharing my joy about my healed daughter on his message board. He was quite furious and ranting about my postings causing so many to go to Germany for help. At that time, it was an open forum. (Postings are now screened, i.e, controlled). David also wanted me to give HIM the rights to my daughter's story that he said he had "heard" I was writing. Please see IAS archives for the real truth He demanded that I meet with him. (He is two hours from me). I refused. I did, however, willingly leave that message board. But, that was not good enough. Days later, David posted at his message board (I have a screen shot of his posting if anyone wants to see it; just message me) that Beverly Doucette and Dawn Rose were resigning from the IAS. Within days, they began the smear campaign against Dr. K and me. For me, my God is bigger than the evil of men (and women). God has gifted Dr. Kruschinski. Period. He gets some of the most difficult; often hopeless cases. One woman in my area who is 46 years old was told to get her affairs in order, as she was dying from an abdomen of CONCRETE. Her organs were hardly functioning. Melissa and I attended/helped with a fundraiser for her and she went to Germany. That was last April. She doubted she would even live to make the trip! I spoke to her just yesterday and she was at the hospital awaiting the birth of her niece. This woman needs additional surgery, they all seem to end up going back or living in the stae that Kruschinski left them in when they cant come up with 30 grand or so more as happens in some cases of severe adhesions. But, she is another story of literally being pulled from the brink of death. She only wanted her life extended long enough so the grandson she is raising can get a little older. God has answered her prayers. The Bible says we (those who accept and live for Christ) do not wrestle against flesh and blood, but against spiritual wickedness and the powers of this dark world. Where there is good, evil will rise against it. One thing no one can change is the story of my child going from a hellish life to one of complete and totally happiness. I wish it for all." What is adhesion related disorder (ARD)? •Pain on movement such as: Walking, sitting or laying in certain positions. •Loss of Nutrients due to poor eating habits or loss of appetite. Psychologial intimidation, bullied...felt forced to leave a support group? (b) Obtaining or using, endeavoring to obtain or use, or conspiring with another to obtain or use an elderly person's or disabled adult's funds, assets, or property with the intent to temporarily or permanently deprive the elderly person or disabled adult of the use, benefit, or possession of the funds, assets, or property, or to benefit someone other than the elderly person or disabled adult, by a person who knows or reasonably should know that the elderly person or disabled adult lacks the capacity to consent. Fort Lauderdale Elderly Abuse Defense Attorney :: Elderly Abuse / Abuse of Disabled Adults :: Davie. Leifert & Leifert - Fort Lauderdale Elderly Abuse Defense Attorney - Davie Nursing Home Abuse Defense Lawyers..